New media has changed the world, as many of us would believe. And true enough blogs, podcasts, social bookmarkers and other web apps have changed our behavior, in the way we consume information, as well as produce and share information online. But while blogs, podcasts and social bookmarking sites are considered to be more of front-runners of the new media scene, feeds work behind the scenes. RSS feeds provide both man-to-machine and machine-to-machine interfacing. In the first case, RSS feeds let people read their online content using feed aggregators or readers, without having to visit the original source of the content itself. In machine-to-machine interfacing, meanwhile, software interfaces with other software using RSS feeds . We do know the importance of being able to read feeds via RSS, of course. Most experienced bloggers and blog readers would prefer to have a single point from which they can scan, read and digest content from favorite sites. The machine-to-machine aspect is not as well-known, but is equally important. For instance, in the network we use RSS feeds to generate inter-network linkages. For instance, latest items from bloggerjobs.biz, bloggyaward.com and blogospherenews.com are reflected across most Splashpress blogs. Also, RSS feeds can be used to synchronize local and web-based calendars, like with iCal and Google Calendar. This brings me to another dichotomy: the search vs. directory argument. In the olden times, when the Web was young, directories were the only way you could find information online. There was Yahoo! and the Open Directory Project, among others. These were usually managed and edited by humans. The main difference with search engines is that sites are arranged by taxonomy–by topic, subtopic and so forth. Also, items are organized by humans, and not ranked and sorted by some algorithm. These days, when you need information, you go to Google or another search engine of choice. You key in a few keywords and the search engine will give you results based on relevance and a host of other factors (like ranking, authority, etc.). But don’t you think directories still have their place in the Web? I would think directories are relevant and important. In a world of seach engines and SE optimization, the relevance of directories is that the content is more structured. You can search for content by interest and by overall topic. And the trend with Web 2.0 these days is to structure content–that is to use and organize content in various ways. One of them is by interest and topic. See for example local review sites and local directories. These produce more relevant content. For instance, a person from Tokyo would find more useful a directory of Pizza delivery stores within his city rather than from a generic worldwide list that a search engine gives him. So as for feeds and directories, Splashpress Media has launched a place where users can find and store RSS feeds according to topic and interest: Feed Vault. This is much like our EatonWeb Blog Directory. Feed Vault is the RSS feed counterpart, but not only for blogs but for feeds (which may include non-blog sites). Feed Vault is an innovative RSS feed directory that features an RSS reader/aggregator, where users can read snippets of the latest published content. Organized by topic, Feed Vault is a useful tool for finding the right information or the RSS-enabled site that readers want. Feed Vault is actually both a feed directory and a feed reader/aggregator. The great thing with Feed Vault is that aside from letting users browse feeds by topic and add these to their own RSS readers, users can actually read content and content summaries right on the site itself. This is done with the Feed Vault reader feature. So, for instance, I’m interested in Apple (as a company and also with its products), I can simply use the reader feature to read the latest posts about Apple. Of course what are directories without entries? And in this case, what is a feed directory without users submitting feeds? 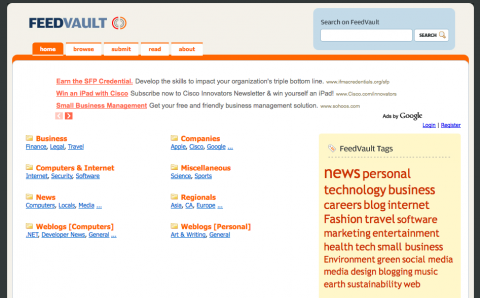 Feed Vault is a user-submitted and human-edited directory. So feel free to add your feeds. That’s what Feed Vault is all about–to keep the world’s best feeds under one roof. Or rather, safely inside in one single vault.